Innovation is the key word of the Hublot brand. A relatively new brand, born in 1976 from the creativity of Carlo Crocco, who moved to Switzerland from the Binda group to make his own watches. Now the brand is owned by the LVMH group and continues to create timepieces of the highest level and quality. Hublot watches have a common characteristic, that of the constant search for the fusion of materials. Experimentation is precisely the strength of the company, which has created not only fusion techniques but also new alloys such as the Hublonium, composed of aluminum and magnesium, or the precious King Gold, a gold with an addition of 5% of platinum. New leagues and new mechanisms, in a constant search for perfection and extravagance. Thanks to these characteristics, Hublot has become known worldwide as one of the most futuristic brands in watchmaking. Some of the reasons that push the house to renew are the very close collaborations with the world of sport and fashion. In 2008 he began his collaboration with Manchester United, then to the entire Champions League and Juventus , putting a Hublot on the wrist of the Euro 2008 referees . The company has also been a sponsor of the World Cup in South Africa and Brazil. The partnership, always in the sporting field, with the Ferrari horse is very important . The Maranello stable has established a splendid and productive relationship with the brand since 2011, combining the characteristics of the two companies in order to create special and increasingly innovative timepieces. The first watch, created in 2012, bore the name Big Bang Ferrari Magic Gold and was manufactured in anti-scratch 18-carat gold. 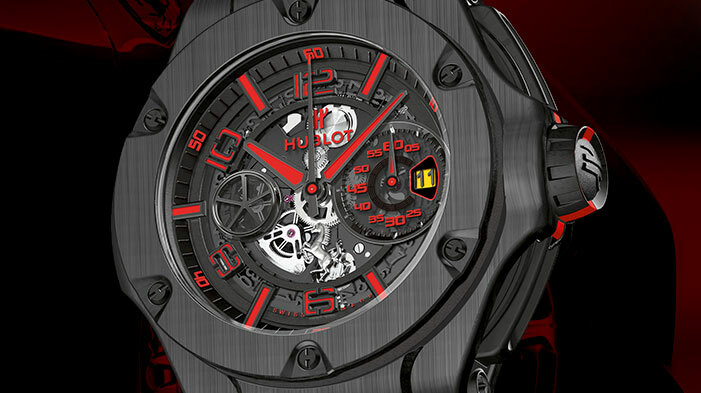 Hublot and Ferrari, from that moment, have started to create dozens of models. In 2013 the collaboration becomes even more important and Hublot decides to create a watch inspired by the stable’s supermacchina , LaFerrari ; This is how the first MP-05 “LaFerrari” was born , a timepiece with a power reserve of up to 50 days and made up of 637 components. Even the price is record: well 244 thousand euros to be able to put in place. Designed step by step with LaFerrari, MP-05 “LaFerrari” is a watch that does not even look like a watch: it is made of black PVD titaniumand the mechanisms are protected by a sapphire crystal with a very complex shape that reveals the whole mechanism, composed of pistons similar to those of the engine of the horse cars. Also the leather and carbon fiber case contains specific instruments for the watch’s charge, whose design is also inspired by the Ferrari universe. Obviously only 50 examples exist in the world. Partnerships go beyond sport by entering with force in fashion. And, to do so, they turned to the one who has been repeatedly called “the most elegant man in the world”, Lapo Elkann . Thanks to the collaboration with Italia Independent of which the scion of the Agnelli house is founder and artistic director, Hublot has succeeded in creating a collection of glasses and two collections of refined watches. The first series is inspired by the yacht world, of which grandfather Gianni Agnelli was a great lover. Based on the Big Bang Unico chronograph, this new Hublot watch uses the stylistic codes of the Agnelli yachts: Azzurra, Agneta, Extra Beat, Stealth and in particular the Tiketitoo, whose hull was dyed with a warm golden color. Also Checkout At what Age can I be Charged as an Adult for a Crime in Florida? The case and buttons are processed in King Gold, the exclusive gold and platinum alloy developed by the Hublot manufactory. The bezel is carved in teak , a precious wood that normally embellishes the bridge of the best boats. With a diameter of 45 mm and a water resistance of up to 100 meters, the watch features the UNICO HUB1242 calico chronograph movement developed by Hublot, which has a 72-hour power reserve. Each model has two straps and these 100 pieces are sold in a case containing also a pair of glasses. But the collaboration with Italia Independent does not end here. Hublot and Lapo Elkann have succeeded in turning the world of watchmaking by literally making fashion into watches, creating the Classic Fusion Italia Independent collection . Based on the model of the elegant Classic Fusion , the watchmakers have succeeded in inserting the precious fabrics of Rubinacci ‘s tailoring in the quadrant , a house that looks more like an institution in the fashion world, since they have dressed not only the Agnelli family, but also the Duke of Kent. Malik is a digital marketer and versed blogger. He has been working in this field for some time now and knows how to balance creativity and technical side of content. He loves to write blogs endlessly and share his knowledge & experiences with others. visit xitepod.com for more info.